I can only echo what has already been said here. This is just a major record. Unexpected and amazing. This is the best album I've heard in a long long time. the one that assures me that contemporary music is doin' just fine. The LP sounds great! I couldn't agree more, fantastic album! The #1 BEST album of 2010. Don't take that lightly, either, there were a lot of solid releases in 2010.... but none that I came back to as much as this one. Fantastic song craft and incredible playing. The 12" LP is pressed on high-quality RTI vinyl (Black) and features a free MP3 Download. 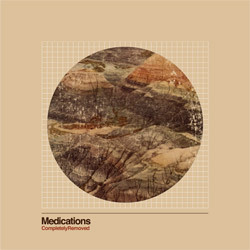 Medications' second full-length album, released in 2010. "Completely Removed" documents a new phase for Medications with Chad and Devin covering all the writing and most of the instrumental duties following the departure of Andy Becker. Not surprisingly the album represents a departure from the band's signature off kilter rockers. The advantage of being able to record and mix the album over several months at Devin’s home studio, Treehouse, enabled the band to focus more time on arrangements and production. This is not to say Medications have lost their edge -the new material dives headlong into new musical territory with thrilling results.